Ask fellow campers about "Finger Lakes State Park" and nearby attractions. This is a nice park to stop at for the night, about 6 miles off expressway. Some sites are level and some not (like most parks) so make sure you have some blocks but overall not too bad. The is a lot of shade and there is some privacy between sites. They only have electric but there is a dump station and water spigots around so you can fill your tank. Electric service was good, cell service ATT was good and we used our hotspots, got a dozen channels over the air. The shower house has individual showers and looked to be fairly new, but could sure use a good cleaning, paper and soap bars everywhere....plenty of hot water. I was told the camp host had a medical issue and had to leave so that may explain the trash lying around the campsites and shower houses. Park ranger was always visible and the checkin lady was very nice. A lot of dirt bike trails so a lot of riders, but never really heard anything but I'm sure there are times when the noise could be bad on the weekends. We would stay here again if passing thru. We camped at Finger Lakes State Park in a Motorhome. Close to Columbia so plenty of places to eat, shop, gas, etc. This park is considered a destination for ATV's and dirt bikes, and has miles of trails to accommodate them. It also has trails for mountain bikes, and lakes for fishing and kayaking. The park is usually full during summer weekends with campers who use these facilities. However, if you stay on a weekday, as we did, you'll find the park virtually empty. It's located less than 10 miles north of I-70, and is worth the trip to attain a spot in peaceful beautiful surroundings. Spaces which are electric-only accommodate RV's. Camp hosts are friendly and very helpful. Our site was level and very large; we had a view of a beautiful meadow from our patio area. 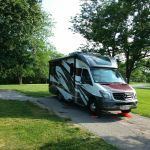 We camped at Finger Lakes State Park in a Fifth Wheel. This is and ATV park but also has biking and hiking trails as well as a lake/water trail. It was very quiet while we were there, perhaps due to the rainy weather. Park is about 10 miles north of Columbia on 63. Not hard to find but it doesn't jump out at you either. Campground is a couple of miles from the check-in so you have to drive in to find a spot and then drive back to register. Nice shower house and paved, mostly level sites. I would avoid the place in midsummer but it has several attractions that others no doubt value. We camped at Finger Lakes State Park in a Motorhome. Are you affiliated with Finger Lakes State Park ?